Many clients have been asking about Indulge’s chemical skin peel, which are designed to “peel away” dead or damaged skin cells from the skin’s surface using a variety of chemical solutions. Since these treatments do not penetrate beyond the skin’s outer layer (the epidermis or papillary dermis), they should not be confused with physician-strength peels that affect the reticular dermis. They are safe, effective, and depending on the strength of the peel can have little if at all downtime. The entire goal of Indulge’s chemical skin peel is to speed up exfoliation in a healthy way, allowing new cellular growth to reach the top layer of your skin for a beautiful translucent appearance. Sloughing away the old skin cells allows the new ones to emerge for a healthier complexion overall. 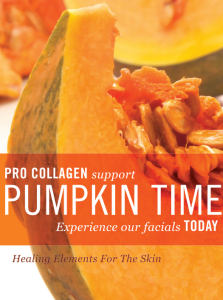 Since fall is upon us, Indulge Salon is proud to announce our latest release: Pumpkin Peels! This deliciously simple yet delectably effective skin treatment brings the power of autumn’s most well-known fruit to the fore. This peel variety is gentler than some, yet leaves your facial skin glistening with a sparkle of youthfulness and vigor as it reinforces its mantra: “Out with the old skin; in with the new!” Be sure to ask us about this fine product next time you stop by or give us a call at 877-913-4402.
Who says the fountain of youth is a hoax? The secret to skin as soft as silk is closer than you think! Click Here to “Extra! Extra! Read All About It! Our boomer clientele will notice several improvements – fewer wrinkles and fine lines, enhanced skin texture and hydration, better skin tone and lightened hyper-pigmented areas commonly called dark spots. The skin is rejuvenated and looks younger. The younger clients choose a chemical skin peel to really clean the skin to help dry out active acne and blemishes, reduce scarring and pore size, or simply to improve the appearance and health of blotchy sun-damaged skin. In any case, chemical skin peels are an excellent way to maintain skin health and slow down the aging process – because they increase cellular production and improve the skin’s elasticity. What’s not to like about that! Please take a minute to read about Kimberly’s experience on our blog at https://www.indulgesalon.com/baby-boomer-peel-the-beginning. In this article, she shares her first-time peel experience with you, and you can see photos taken before and during the process. Have a close look at these photographs if you’d like to get a better understanding of what the treatment looks like while in progress. What types of peel do we offer? Light – which only removes the outer layer of the skin and does not cause an immediate exfoliation. There is no down time. Medium – which affects the intra-epidermal layer and causes a light, flaky peeling within 2 to 3 days after the application. There is little or no downtime and the resulting exfoliation is similar to a sunburn peel. Intense – which affects the deepest intra-epidermal layers so the skin first becomes slightly brown and crusty and then produces considerable peeling within 3 to 4 days after the treatment. Rather than flaking, the skin will peel in larger segments until the process is completed – with a week to 10 days. Your treatment is completed in three appointments that are included in the fee. Step 1 is the assessment and last 40 minutes. A fully trained Indulge Skincare Specialist will work with you to determine which chemical skin peel is best for your skin type and specific needs. You will enjoy a Pre-Cleanse Facial so the skin is thoroughly prepared, and as an added precaution the selected Skin Peel Solution is patch-tested on your neck or behind the ear. This test is for your benefit and can help spot potential allergic reactions. Keep in mind that not every individual will qualify for this amazing treatment as it depends on his or her specific skin sensitivity. Step 2 is the actual treatment, which takes 20 minutes and is scheduled within one week of the initial appointment. The skin is prepped, and you will be given a small handheld fan to lessen the stinging sensation that occurs when the solutions are applied. This discomfort usually lasts 5 to 10 minutes, depending on the strength of the solution selected for your skin type. When the treatment is finished your skin may have a frosty white appearance – a perfectly normal symptom that usually fades within a few hours. Your skin may be also be very red and will continue to redden and feel sensitive over the next 24 hours. It then becomes brown just before peeling begins, which is usually between the 3rd and 5th day. Skin usually becomes tight and dry during the process, and there may be slight swelling. It can look as if you experienced a bad sunburn (the one you get when you fall asleep on the beach), where your skin gets red, itchy and flaky. If you select the Intense Skin Peel your skin can get a brown crusty appearance just before it peels. The overall reaction depends on your skin type, sensitivity, the intensity of the peel and how well you care for your skin at home. Step 3 is a 10-minute follow-up appointment so our specialist can check your progress and answer any questions. For optimum results your homecare regimen is just as important as the peel itself. On day 1-3 simply rinse your skin with water and pat dry, applying the post treatments that are specifically recommended for your skin type. Use these as directed by your Indulge Skincare Specialist. On Day 4 you can begin cleansing and wearing Epidermal Growth Factor and SPF 30. Our specialist will have very specific recommendations so you can treat your skin with integrity for long-term success. Also follow our three NOs. . .
No picking. If you pull the flaking skin too far and it is deeply attached on one side it can cause bleeding and scarring. It’s really not worth taking the chance. No direct sunlight for at least three weeks. We really prefer that you wait six weeks, and if you never went into direct sunlight again we would be even happier. No makeup for one week after treatment. However, we understand if you really need to. At least make sure you use the sunscreen and other post-care treatments we provide for optimal results. An Indulge chemical skin peel are highly advanced and can be repeated every six weeks. The number of peels required for any given problem varies with each individual. We guarantee you will see positive results the first time. Your new, smoother, less-wrinkled skin will look younger and refreshed. You will love the way you look. My name is Cindy and I had a Kojic Clay Peel done on October 21, 2014. I was a little concerned when one step of the facial peel process started to burn. I was told prior to my facial that this would happen. I was given a fan to use on my face, so soothing. When the Kojic Clay Peel was done I looked like I had a bad sunburn. As the days went on I looked like I was 15 years older due to the process of the peel. It started to get shinny then the peel began on the third day. Wonderful results with this peel, most of my sun spots had disappeared, lines on my face had smoothed and my complexion had greatly improved. Still today my face is soft and smooth. I would do this peel again. Thank you so much Priscilla!!!!!!!!!!!!!!!!!!!! I just wanted to write to let you know how happy I am with the facials, skin care, and advice Pricilla has provided me with since August. My first visit was for a pedicure diring that time I met Pricilla after I asked for her opinon about some acne issues I was dealing with. After 3 years my skin looks better than ever! Pricilla is very patient and kind with every service. I bet you already know but you have a excellent dedicated employee on her.